As my earlier post mentioned, the chainsaw mill brackets for the first slab didn't work well. The system was simply turning 2x4 lumber on edge to then run the mill along. The weight of the saw, the lack of perfectly level and straight 2x4s, and the narrowness of the rails all factored in to a less than flat initial slab. Well my Yankee ingenuity got the best of me. I spent some time building my own slab rail system. I cut a 3/4" thick piece of plywood down to 24" wide and 7' long. To add even more height and strength to the bracket, I actually sandwiched two sheets of plywood together, then added a metal frame to the underside (1 1/4" square tubing). 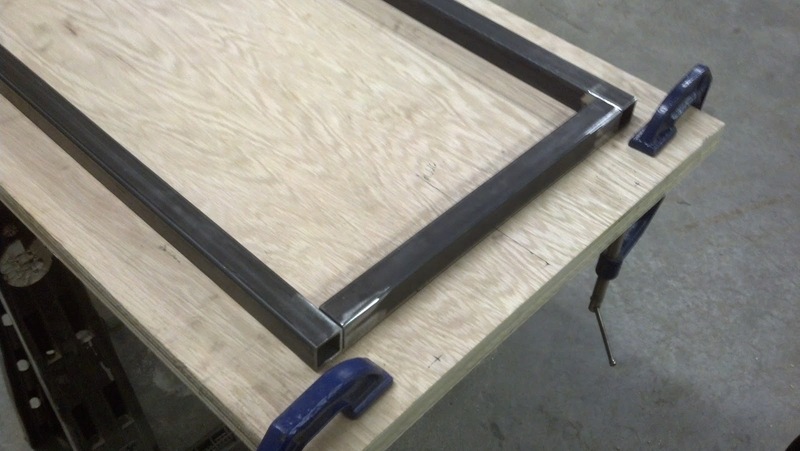 The frame adds strength as well, but I mostly wanted the metal to create a level and square frame to attach the plywood. 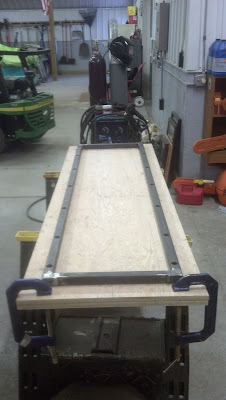 These photos show the metal frame; this is the side that will be resting on the log. To attach the plywood to the metal frame I counter sunk, both the bolt head/washer and the threaded end with the nut/washer. Another fault with the factory arrangement was that both ends of the log needed to be cut close to parellel for the slab rails to stay in a level and square arrangement. With the shear mass of my slabbing rail, only one end needs to be attached to the log. This is almost imperative for the size logs we will be working with. I gave the rail a test run and couldn't be happier with how it worked out. If the spring weather breaks, Joel and I will be milling again on Friday. Check back for updates! I have read your article post. very nice. Everything I fully expected of these tools. Great review! Chainsaws are very useful and yet very dangerous power tools. Did you know that every year, about 4,000 people get injured when using chainsaws? If you want to buy a new chainsaw, you must consider some significant points. This is a guide for the person interested in buying a lumber saw mill. We consider the advantages and disadvantages of the three main sawmill types. Unfortunately thousands of accidents happen each year with a chainsaw and many of them are preventable if only the operator heeded the safety warnings and learned how to properly operate the chainsaw. Below are a few tips to keep in mind when operating a chainsaw. I was seeking to know about chainsaw mill and I found your blog post.You told very clearly that I really understood.Thanks for sharing great information with us. The way that they're fueled by power from an appended rope influences utilizing an augmentation to string an absolute necessity.